I know, you are asking "what on earth is Hutspot"? It is a very simple Dutch dish, inexpensive, easy to make, tasty and filling. Simply put, it's Dutch comfort food. It doesn't look like much, but it is tasty. I am of Dutch ancestry, and this was a meal that my mother sometimes served if her day had been unusually busy. Her version was all cooked together in one pan, preparation was easy and clean up was minimal. The ingredients were simple and usually in her pantry. There are many versions of this dish, this one is my mom's. Peel and quarter potatoes, peel and slice carrots, peel and coarsely chop onions. Put the vegetables in a sauce pan, and cover them with water or broth. Add salt and pepper to taste. Sometimes I add a bay leaf. Bring this to a boil, then reduce to simmer and cook for 10 to 15 minutes, until vegetables are not quite tender. Add the smoked sausage ring or links on top of the simmering vegetables, and simmer for 10 more minutes or until vegetables are very tender. Remove sausage and drain the vegetables. Add butter and milk to the pan, just as you would for mashed potatoes and mash everything together. (Remember to remove the bay leaf if you added one.). 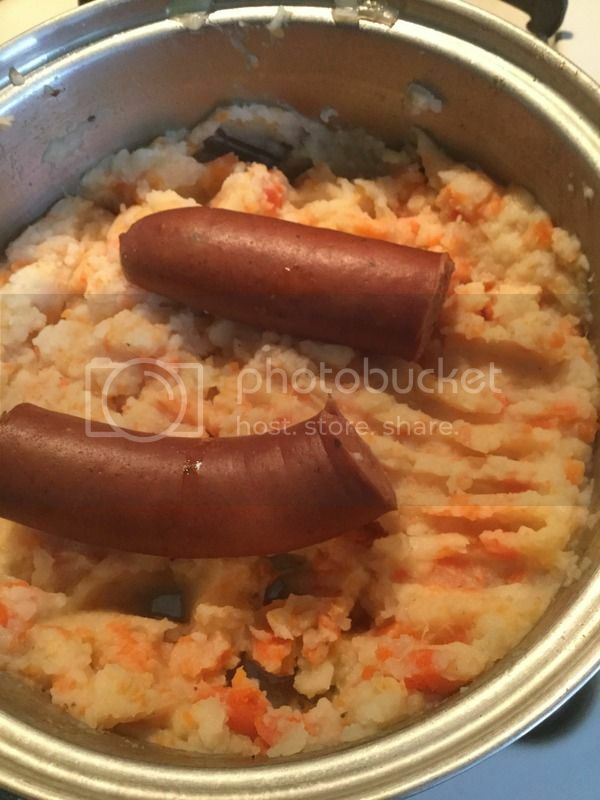 Cut sausage into serving size pieces and serve with the mashed vegetable mixture. We often got homemade applesauce on the side. Some serve this with pot roast and gravy, or meatballs and gravy, rather than smoked sausage. Bacon is a popular addition. Dutch mustard is sometimes served with hutspot. It is said that it tastes better if the onions are sautéed in a little oil or butter, rather than being cooked with the potatoes. I've been too lazy to try this, but I suspect that this is probably true. Some recipes call for adding the smoked sausage at the beginning of the cooking time. I think this makes the sausage tasteless, but I will admit that it imparts a bit of a smoky flavor to the potato mixture.